A cute vinyl decal for my lap top! Here's how to make it. Step 1: Design your decal using the Silhouette software. I used the heart flowers design by Lori Whitlock. I measured the area I wanted the design to fit on my laptop, and sized the image appropriately. I used three of the same image right after each other. Step 3: Cut out the vinyl area around the design, and then peel off all the excess vinyl. Step 4: Cut out a piece of transfer paper in the same size as your vinyl paper. Step 5: Peel the sticky part off and place it sticky side down onto your design. Use a credit card to rub the paper down onto the vinyl. Step 6: Peel the transfer paper off. If any of the design starts to get left behind, just put the paper back down and rub the area again with your credit card. Step 7: Place the tape onto the laptop cover. Rub again with a credit card, and then peel off! Linking this project up to all the parties in the link at the top of my blog! So cute! What a great idea. 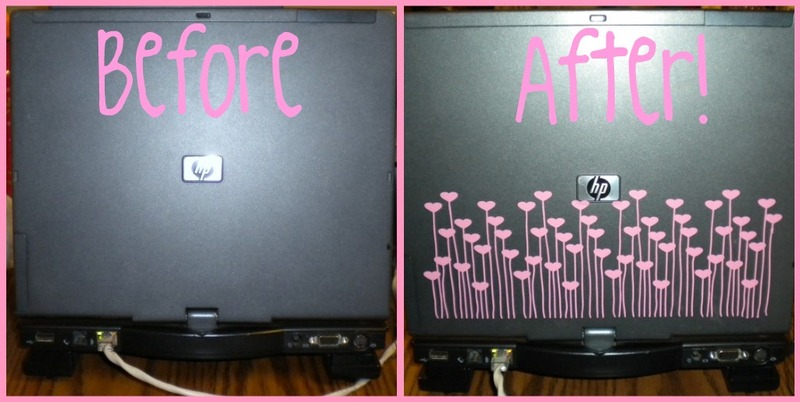 I think I may have to do something like this to my laptop. this is super super cute!! great idea! i like how the hearts have steams and look like flowers!! Aww, very sweet! I love it! I love my Silhouette. And I just recently discovered Expressions vinyl, just in time. I'm going to make some his and hers pillow for an engagement party my husband and I are going to next month. And that is adorable--pink hearts--one of my faves! Love this! What a great idea!! Thanks for sharing, found you at Lovely Crafty Weekend! Well this is fabulous! Maybe should consider doing this for my laptop! Super cute! I need a Silhoutte! It looks so cute! I think you might have inspired me! After I saw this I went and painted my wall like it! I had been looking and looking for somthing to go on my bare wall in me new sewing room and then when I saw this I got excited and went and painted it! Love it, so cute! I have a Bosskut Gazelle so I might have to try this tutorial. one more reason why I wish I could make vinyl things!!! I would love to have something like this. Ack!! That looks amazing! I have been wanting to do the same thing! Such a cute idea. I want a silhouette machine more than you can imagine. I sign up for every give away. If I don't win one soon, I'm going to have to just give in and buy one. I am your latest follower. I would love for you to come and check out my blog and follow me back at www.diybydesign.blogspot.com. Thanks so much. Wow, I love it! I also love your blog which I just found! I am not following. Super cute! So cute! Now I need a silhouette so I can do this too! So adorable! I love it. I definitely want to decorate my laptop now. Thanks for sharing! Very cute idea! I knew I should have bought a silhouette - so many cool things you can do with them! I love the way your design turned out! Adorable! I have a Cricut and wish I had a Silhouette. SO cute! I love my silhouette!!!!!! This looks so cute, love the colour you used! Love it! :) I might have to look into getting that machine! I could see lots of projects happening with that! Thanks for sharing! Such a great idea! And now you'll always know which laptop is yours - so unique! The possibilities are endless with that machine! Love the pink heart flowers, too cute. I am on the fence on buying one, since I have an expression machine that isn't very old. LOVE IT! I want a silhouette. I think I will be asking for one for my bday this year so I can have a laptop as cute as yours! OH My! I love your design so much more than mine! I also wish I had some pink vinyl. Thanks for stopping by my blog. Stephanie at Full of Great Ideas. 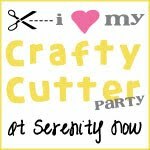 I am having a party on April first for $0 craft and decor ideas. If you have anything I would love for you to stop by and share. That looks great! I have been meaning to do mine too but I don't have any fun vinyl colours right now. I love the pink! Do you have to have one of those machines or can you cut out the vinyl with an xacto knife? so cute! Thanks for linking up to Craft Couture Monday. I was just visiting Young Nester and saw your laptop vinyl and I LOVE it. So cute I have been looking for something for mine and thats such a good idea ..